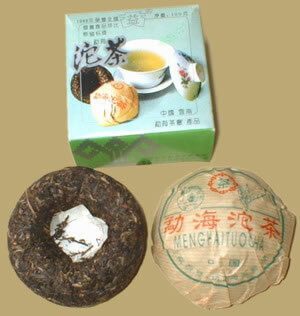 This Green Pu-erh Tuocha (also be known by panda Tuocha) comes from Menghai Tea Factory, it won panda prize in 1988. The tea is in its second aging stage, it taste smooth but still has some astringency, will gets softer after 3-5 brews and yields a pleasant taste of the freshness leaves. A nice raw pu-erh to drink now or to keep a few more years. PREPARATION: To prepare Pu-erh tea from Tuocha, it is best to use a strong knife to pry out the desired amount leaves and place in a teapot. Rinse by covering with boiling water and quickly pour off. Cover with boiling water again and let steep 5-30 seconds (depending on how light or dark you want the tea) and serve. Pu-erh tea can be steeped 10-20 times.